We had this for breakfast yesterday with phulkas. I made aloo-palak stuffing for parathas but made phulkas instead. 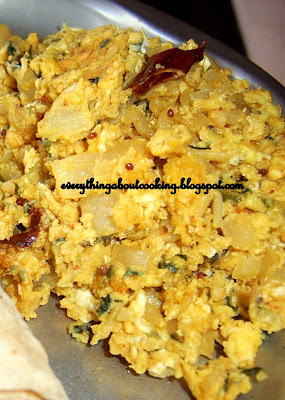 S wanted eggs with his phulkas and I just combined aloo-palak with eggs and he loved it. He now insists that I make his eggs this way. Heat oil in a kadai/pan and add the mustard and cumin seeds. When they start to splutter, add the dried red chillies, curry leaves and hing (if using). Add the chopped onion and green chillies and saute till translucent. Add the ginger-garlic paste(if using) and saute till the raw smell disappears. Add the chopped spinach, tumeric and saute for about 5-7 mins. Add the mashed potato, salt, red chilly pwd,garam masala, cumin and corriander pwds, mix well and saute for another 5-7 mins. Add about 2 tsps of oil and mix. Beat the eggs in a container and add it to the mixture , mix well and cook till the eggs are completely cooked. Switch off, add the lemon juice(if using) and garnish with cilantro and serve. 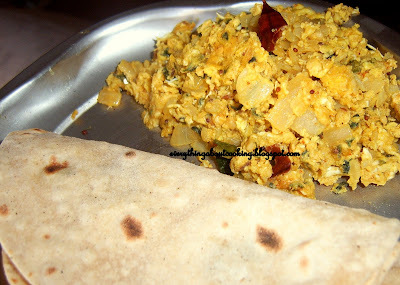 I like the idea of combining eggs and potato.Makes a great side for chapathis.